Theme Pack for Styles and Layouts Gravity Forms plugins lets you design your forms within seconds. This pack consists of 30+ beautifully crafted themes. Using Theme pack is extremely simple. Here is a video to show you how you can instantly design forms without changing any settings in Styles and Layouts for Gravity Forms Plugin. Here are screenshots of 30 +themes which are included in this pack. Do I Get Updates for Plugin? Every purchase get updates for one year. You will need to renew your license key after one year to keep getting updates. The addon will work even if you don’t renew your license. Renewal licences have 30% discount from purchase price. How Can I Upgrade License? You can upgrade your license from accounts page. How Do I Get Support ? If you face any issues with the addon then contact us using support page. Make sure you have an active license before contacting support. Which Payment Modes are Supported? We support PayPal for payments. You will be automatically redirected to PayPal from checkout page. How do I Download the Addon? 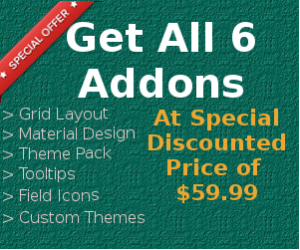 After successful payment you will receive email with download link and license key for addon. You can also download it directly from accounts page.